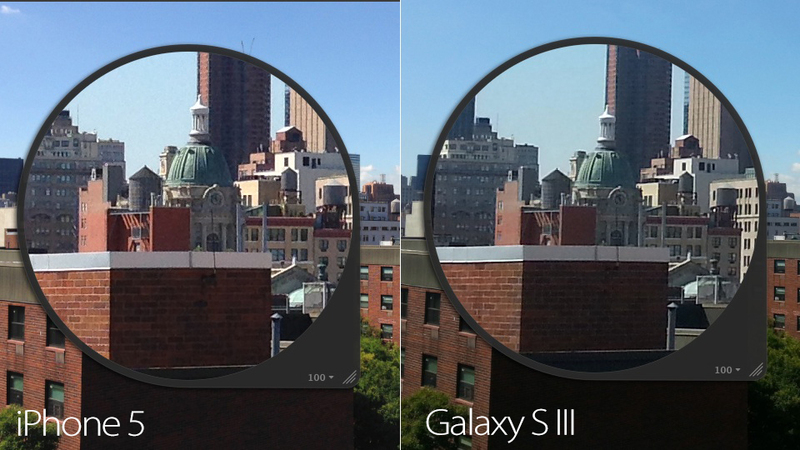 For many of the people scooping up an iPhone 5, its 8-megapixel camera will be their go-to shooter. But how much of an improvement is it over the iPhone 4S? 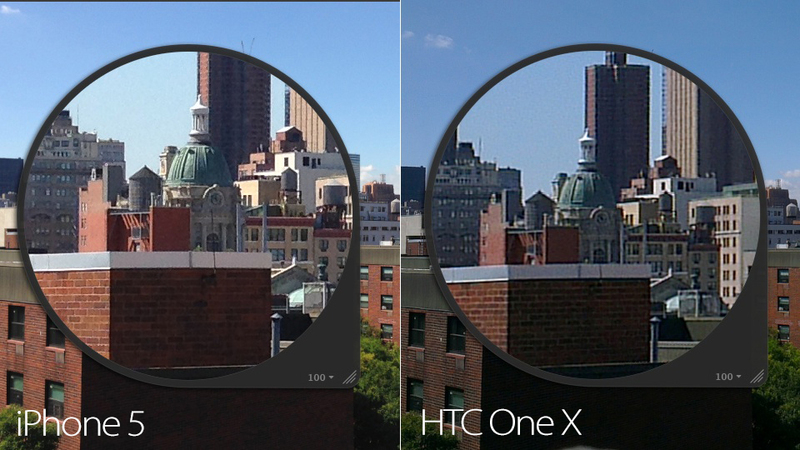 And how does it compare to the smartphone—and point and shoot—competition? We tested the iPhone 5′s camera against the iPhone 4S, the top Samsung Galaxy S III, HTC One X, and Nokia’s preposterously high-resolution, 41MP 808 PureView. And just to see if it can really hold its own with high-quality, pocketable point-and-shoots we put it up against the Canon S100. 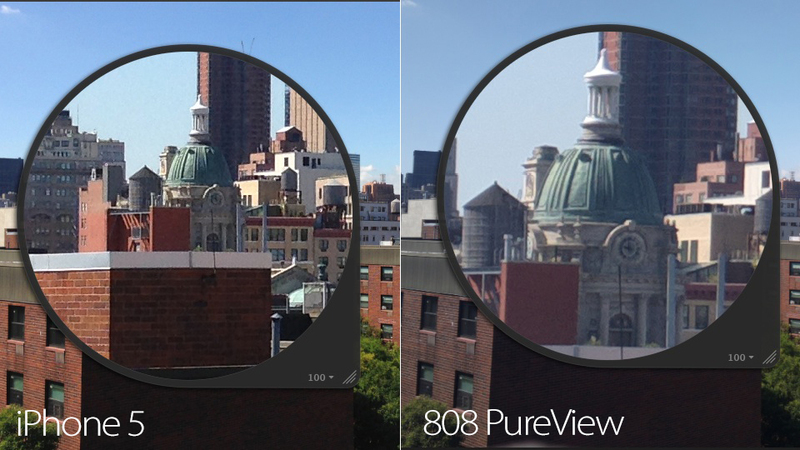 Can the iPhone 5 keep up with (or outshoot) these cameras in everyday conditions? We tested two very common situations: a daytime cityscape, and a very low-light close-up in the darkest corner of the office. Below, we’ve collected a series of side-by-side comparisons. 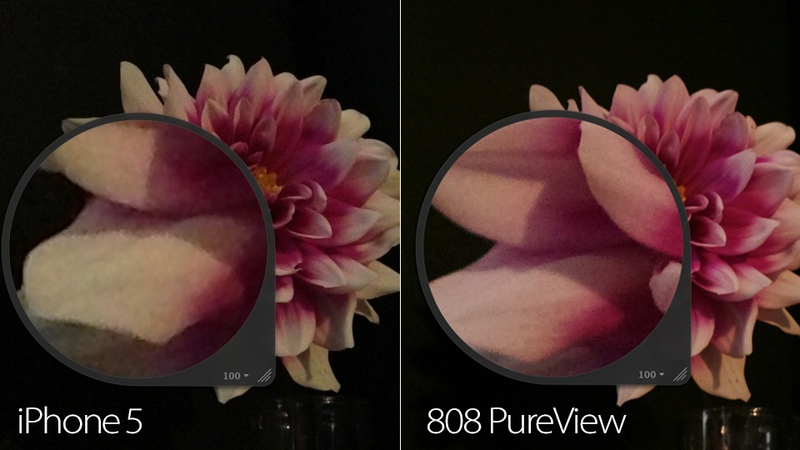 The area inside the loupe will be at 100-percent resolution if you click to expand each of the images. The cameras all have slightly different focal lengths and stock apertures, but we did our best match the field-of-view in each of the shots. Beyond image quality, we were also interested in the speed of each camera’s performance. The main addition to the iPhone’s camera arsenal in iOS 6 is panorama shooting. But otherwise the camera app’s interface is the same as ever, which is to say crazy simple. Every other camera we used has way more customizability—from manual function controls to continuous shooting modes to additional scene settings. The iPhone just takes care of all of that for you—or expects apps like Instagram or Camera+ to provide filters and processing for tinkerers. That makes the iPhone 5 an easy camera to use, but that simplicity turns out to be a major drawback when shooting in the dark. Every other camera in our test has a built-in low-light setting that use fancy tricks to improve image quality and reduce noise and distortion. On the upside, the iPhone 5′s A6 processor makes a huge difference compared to the A5 in the iPhone 4S. The camera’s focus and shutter responds faster to touch and when you hammer on the volume button repeatedly to release the shutter, the iPhone responds like a blazing semi-automatic automatic weapon. All that being said, what really matters is the final product. So how does the iPhone 5 snapper stack up? From what we heard at announcement time, it would seem the iPhone 5 and the iPhone 4S have nearly identical 8-megapixel cameras, but as this image shows they take very different photos. The iPhone 4S tops out at a maximum sensitivity of ISO 800, which just isn’t enough to get a properly exposed photo in a dark situation without flash. Apple’s greatly improved the image processing on the iPhone 5 such that the camera can now shoot up to a sensitivity of ISO 3200 while still ending up with less noise. This is a sea change. If you like taking photos in dark bars and you’re addicted to Apple’s iOS ecosystem, this upgrade is essential. Similarly, the iPhone 5 is a much better camera during the day. It’s not even close. Look at that sharpness. That said, when taking photos in the dark, the iPhone still falls short compared to most of the other cameras we tested. Here, the Samsung Galaxy S III’s low-light setting does a really great job. It’s sharper and less noisy in the dark than the iPhone 5. 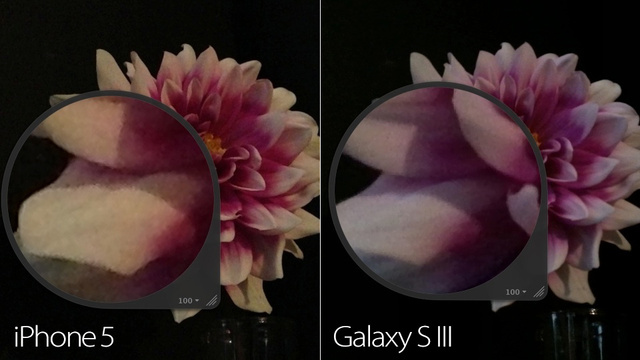 The S III also did a better job with colors; it captures a true white and the correct, more-purple-than-pink color of the flower. During the day, though, it’s a close call between the iPhone 5 and the Galaxy S III. 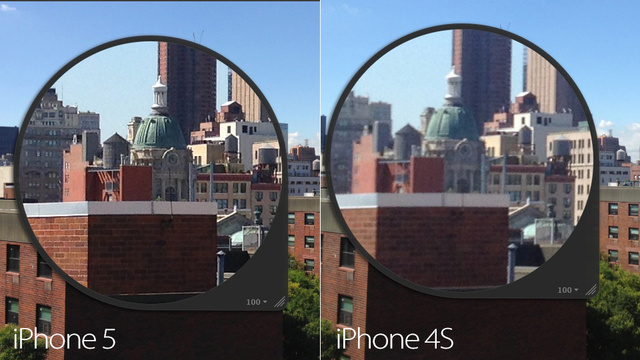 From this particular image the iPhone 5 looks slightly sharper and it also has better dynamic range. 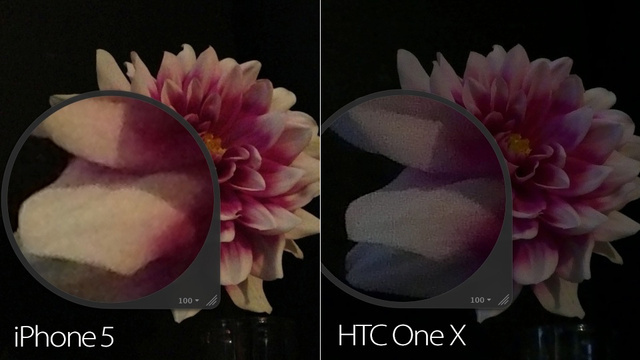 Like the Galaxy S III, the HTC One X does a better job than the iPhone 5 with the color of the flower, but the regular, spotted noise pattern is also much uglier. 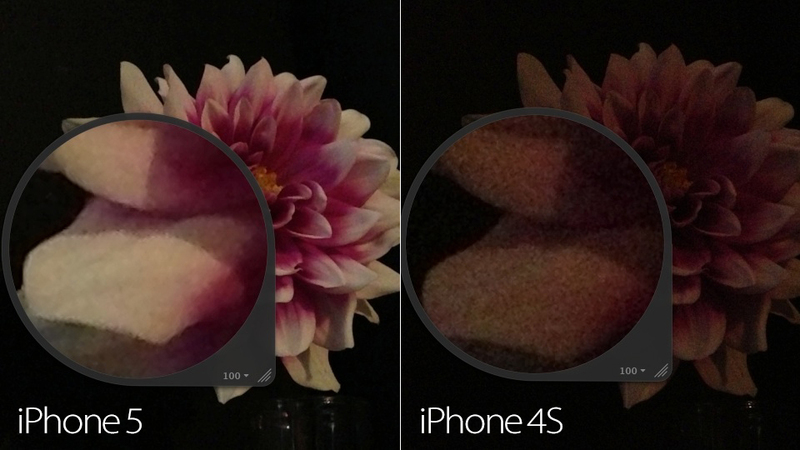 We prefer the blended swirl of the noise on the iPhone 5. Even during the day, the HTC One X is a distorted mess and the dynamic range is completely lacking. iPhone 5 wins. Nobody’s ever going to buy an Nokia 808 PureView in the US, but boy does the 41-megapixel 1/1.2-inch sensor on its camera deliver. In the camera’s low-light setting, it doesn’t shoot at full resolution, and instead uses the extra photodiodes on the sensor to help reduce noise. The result is this lovely sharp image. And the comparison in the dark doesn’t begin to tell the story during the day. This is what the PureView’s 41-megapixels can do. Hopefully we’ll see this badass camera in a good domestic smartphone sometime soon. The Canon S100′s full-resolution low-light setting is fantastic, and this image shows why mainstream phones like the iPhone 5 just aren’t anywhere near taking over the world from point-and-shoots—at least in terms of image quality. Compared to every other photo in this test it’s virtually noise-free. The downside of course is that the camera smooths everything out so much that it loses sharpness and detail. 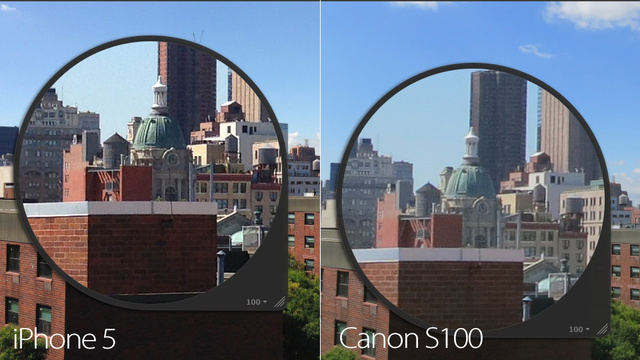 While we’d expect the iPhone 5 to crumble in daylight compared to the S100, it puts up a fight. The photo on the left is maybe slightly sharper, but there’s also a lot more noticeable distortion. As with photos the iPhone 5 takes much better video than the iPhone 4S. And really, it does very well when compared to nearly everything else. In this test, it’s a tossup between the iPhone 5 and the Samsung Galaxy S III. That’s impressive. The iPhone 5′s camera is a significant improvement from the iPhone 4S both in terms of image and video quality. It holds its own compared to the Samsung Galaxy S III—the top camera on a smartphone people are actually going to buy. Still, there’s a lot of room for improvement. Apple really needs to add additional settings for darker conditions. Yes, our low-light test was extreme, but Apple can and should do better. In short, the iPhone 5 camera is better, and as before, it’s suitable for snapshots. But if you’re serious about good-looking memories, you should keep a point-and-shoot around. We’re dreaming someday Apple will adopt a camera as good as the 808 PureView or the Canon S100. Sigh, someday.